Been the victim of a virus attack and cleaned it out...but still unsure whether your system has had its security settings altered? Then consider Rizone Security Restore. This freeware utility will restore the security settings of your computer to their defaults, so that any changes to the settings made by malware will be undone. Rizone Security Restore returns your PC's security settings to defaults, helping your PC recover from a malware infection. Using the program is exceedingly simple. 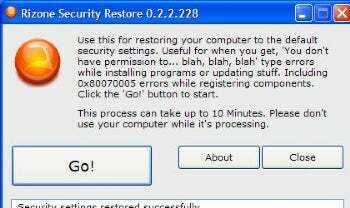 Run it, click Go, and Rizone Security Restore reverts your system to its default security settings. It will take some time, possibly more than the 10 minutes the program suggests. On my test system, it took between 10 and 15 minutes to do its work. Be careful when using Rizone Security Restore. In fact, consider it a last resort, because the program can't tell your carefully chosen security settings changes from those made by malware. It will revert all security settings, including those that you have changed, back to the defaults. Use it only if you've already suffered--and mostly recovered--from a malware attack.